Made of high quality water resistant 1000D military nylon fabric, lightweight, scratch-resistant, not easy to fade Dimensions: 11"(L) x 6.3"(W) x 18.5"(H). Main Compartment holds your 14 inch laptop and daily clothes, magazines; Middle Pocket fits 10 inch iPad; Front Pocket for your iPad mini or 7.9 inch tablet, cell phone, cards, pens and other small items easy to access; 2 Side Pockets for you bottle cup and umbrella Features with adjustable shoulder straps and chest belt, ventilated mesh padded back & shoulder straps, ensure wearing it with comfort even in long distance hiking 2 D-Ring buckles on the strap which is convenient for you to hang your sunglasses, cap, accessory kits and other items; A velcro section on the front, easy to paste your favorite pattern and decorate your bag to be the unique one Perfect for hunting, camping, travel, trekking, tactical, outdoor, cycling, motorcycle, saddle bag and other activities. 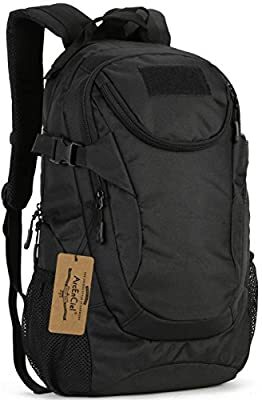 A great small tactical backpack / travel daypack for everyday use!